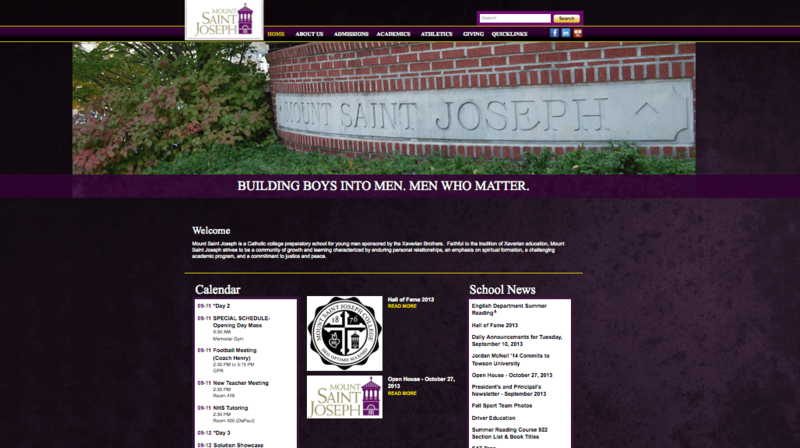 Mount Saint Joseph High School is a prominent and prestigious boy’s Catholic School that strives to provide the best education in both spiritual matters and academic excellence. As one of the leading Catholic boy’s schools, they make an effort to work with every student to help him learn and grow in a community of like-minded individuals. Every student is encouraged to evaluate himself academically, spiritually, and physically. The faculty and staff also take time to review each boy’s successes and advise him on what he can do to improve himself in all areas of life. There are a few standard values for which Mount St. Joseph stands, all based on the Xaverian method of education. These include humility, trust, zeal, compassion and simplicity. Their belief is that these qualities will lead to a healthy spiritual life and help give the boys the self-discipline they need to succeed in the world. Teachers make an effort to both exemplify and help instill these values. Physical health is also important at Mt. Saint Joseph’s. They encourage every student to be part of the team and the family in order to be healthier, happier human beings in every aspect. They offer sports all three seasons encompassed by the school year. Boys can choose to play either competitively or on an intramural team depending on their level of athleticism. Visit the newly designed website for more information on admissions, athletics, academics, and how you can give back to the Mount St. Joseph’s Community.